Inner Civilization: What Shall We Call This Thing? What Shall We Call This Thing? Since the earliest times there have been teachers, guides and communities who have worked to awaken the hidden divinity buried within us. They have developed teachings meant to clear away the clouds of fear, ignorance, hatred, anger, jealousy and agitation in order to allow the light of divine consciousness within to shine through. The key to these teachings is to rise above emotions, thoughts, and even prayer to experience oneness with the source; the unity underlying all that exists. This is called the Divine Self, connecting all life. And uncovering this true Self is what is meant by 'self knowledge'. These teachings come to us out of the mists of history and have been expressed in many different forms over time and in different regions. They were taught in Ancient Egypt (Kemet) but there is ample evidence that many of the concepts Egypt adopted came from an earlier Nubian culture. 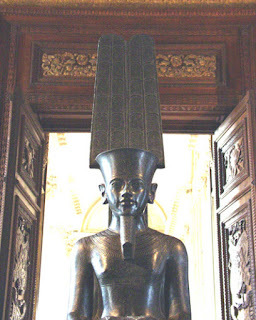 Amun is generally translated as "the hidden one", and a symbol of creative force. It was related that he created himself and then created everything else while remaining distanced and separate from the world. When he merged with 'Ra' he became both the seen and the unseen Divnity in the universe. Within Egypt, among the priests, it was understood that the popular understanding of the culture was different from the esoteric teachings. 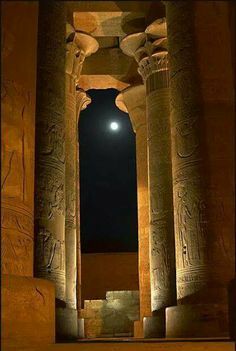 According to tradition, the temple at Karnak had two parts, the outer temple which was designed for beginning initiates and the inner temple where one could enter only after proving one was ready to acquire the higher knowledge and insights. For knowledge, you should know that peace is an indispensable condition of getting it. Man, know thyself ... and thou shalt know the Neteru. West as gods) were all aspects of the same essence, that's why it was taught that they were related - either brother, sister, child, mother or father. However, over time this notion always threatened to become lost as traditions and customs relating to the different individual 'gods' developed. And sadly as more invasions and encroachments from other nations (Greeks, Assyrians, Romans) to the north persisted these teachings became more cryptic and secretive. Nevertheless, union with this essence was always the underlying goal. From The Instruction of Merikare, Middle Kingdom, (2025BC-1700 BC). 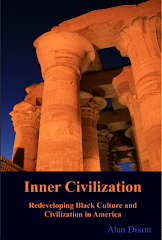 After 3000 years, Egyptian civilization began to decline following successive invasions from Assyria, Persia and Greece. It was finally absorbed into the Roman Empire in 30 B.C. However, as it became increasingly tied-in politically with the eastern Mediterranean world, the spiritual atmosphere Egypt created and its wisdom remained part of the region’s culture. ~Thanksgiving Hymn 25 Qumran scrolls, published by E.L. Sukenik in 1954-5. In the first century A. D., there were a number of spiritual orders in North Africa and the Middle East. Among them were the Essenes. The Essenes were an aesthetic group that thrived in various communities in North Africa and ancient Palestine. Two ancient scholars, both of whom were contemporaries of the first century Essenes: Josephus Flavius and Philo of Alexandria had personal knowledge of the ancient Essenes. In regard to the origin of the Essenes, both make clear that the Essenian roots are incredibly ancient. Josephus declares that the Essenes have existed "from time immemorial" and "countless generations." Philo agrees, calling the Essenes "the most ancient of all the initiates" with a "teaching perpetuated through an immense space of ages." These roots can be traced back to the mystery schools of Kemet. Scholars now affirm that Hebrew spiritual knowledge originated in the teachings of Ancient Egypt. For example the noted Egyptologist Hugo Gressman observed that," in their ideas about God…the Egyptians of the 18th and 19th Dynasties were far in advance of the Hebrews of the early monarchical period." This gives Acts 7:22 significant meaning, even if that meaning is figurative: "And Moses was learned in all the wisdom of the Egyptians, and was mighty in words and in deeds." [Acts 7:22]. "The Law was planted to reward the children of Light with healing and abundant peace, with long life, with fruitful seed of everlasting blessings, with eternal joy in immortality of eternal Light." -The Manual of Discipline, Dead Sea Scrolls. 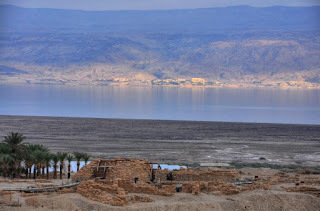 The Essenes, lived at the Dead Sea in Palestine and at Lake Mareotis in Egypt. In Palestine and Syria the members of the brotherhood were known as Essenes and in Egypt as Therapeutae, or healers. 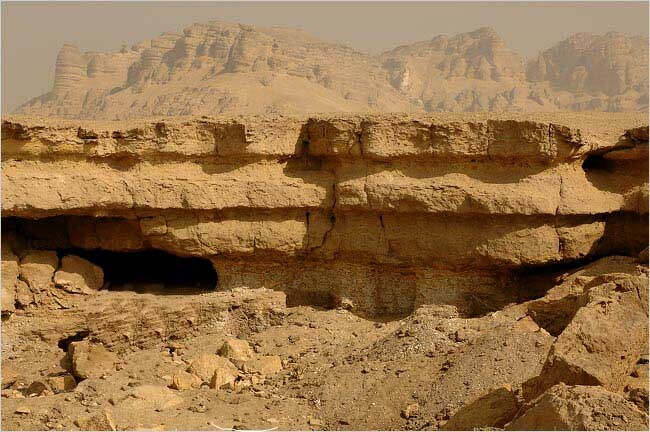 Clay jars, distinctive and Egyptian in style were also found in the communities in Qumran. The Essenes lived on the shores of lakes and rivers, away from cities and towns, and practiced a communal way of life, sharing equally in everything. They spent much time in study both of an array of ancient writings and special branches of learning, such as education, healing and astronomy. They were said to be the heirs of the Egyptian arts of healing. They were adept in prophecy for which they prepared by prolonged fasting. 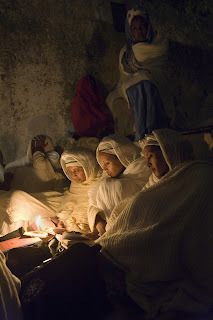 They lived a simple regular life, rising each day before sunrise to study and commune with the forces of nature, bathing in cold water as a ritual and donning white garments. Their evenings were devoted to study and communion with the heavenly forces. The meaning and the origin of the term 'Essenes' is still unclear. 'Essene' may have come from the Greek 'Essaei' meaning the humble or pious ones, or from the Aramaic, 'Asa' to heal, or 'the healers'. There is no record that they called themselves Essenes. They called themselves 'sons of the light or the 'Children of Light,' this is the same term used to describe early followers of Yeshua. 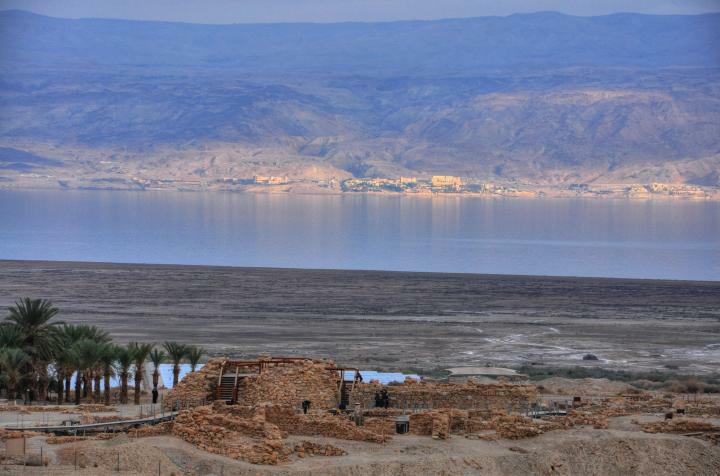 Many researchers believe Yeshua (Jesus) and John the Baptist were associated with the Essene community -and there are many parallels in their teachings and way of life. They are often referred to as Jews or members of a 'Jewish sect' but this is misleading. Names not only describe, they often give meaning. Names can also limit meaning, cause confusion, and restrict understanding. Judaism as we know it didn't exist during their time. It's also important to note that the term 'Jew' was applied by the Romans to any people living in Judea. There was no distinct ethnic group called a Jewish people at this time. The people in Judea at the time were a mix of Ancient Israelites, Hittites, Canaanites, Edomites, Babylonians, Persians and Greeks, among others. "The people of Israel, and the priests, and the Levites, have not separated themselves from the people of the lands, doing according to their abominations, even of the Canaanites, the Hittites, the Perizzites, the Jebusites, the Ammonites, the Moabites, the Egyptians, and the Amorites. For they have taken of their daughters for themselves, and for their sons: so that the holy seed have mingled themselves with the people of those lands." It is equally misleading to refer to the Essenes as early Christians although there is evidence they were involved with James the brother of Jesus and his leadership. In Palestine and North Africa there were many adherents to the new movement inspired by Yeshua (Jesus); none of them referred to themselves as Christian. 'Christian' and 'Christianity' more accurately refers to the name and shape the movement took as it moved West to Greece and Rome, as interpreted by the self proclaimed Apostle Paul -who was thoroughly Hellenized. There were many different views and modes of spiritual practice during this time (1st Century A.D.), before Rome imposed it's 'official version' of belief and worship on the people of North Africa, Europe and the Middle East after 325 A.D., in the form of Christianity or Roman Catholicism. With the discovery of the Nag Hammadi texts containing scriptures and writings outlawed and suppressed by the Church in Rome, it's now possible to get a better picture of the diversity among those who initially believed in Jesus in the early centuries after he left Jerusalem. There were a number of names for his disciples and for the communities that believed in his teachings. Among them were the Nazarenes. The original 'Jewish' followers of Yeshua as Messiah were an ancient Jewish sect known as the Nazarenes ( Acts 24:5). The "church father" Jerome (4th Cent.) described these Nazarenes as those "...who accept Messiah in such a way that they do not cease to observe the old Law." (Jerome; On. Is. 8:14). The fourth century "church father" Epiphanius gives a more detailed description: But these sectarians... did not call themselves Christians—but "Nazarenes," ... However they are simply complete Jews. They use not only the New Testament but the Old Testament as well, as the Jews do... They have no different ideas, but confess everything exactly as the Law proclaims it and in the Jewish fashion-- except for their belief in Messiah, if you please. This ancient sect of Jewish believers in Messiah used an apocryphal synoptic Gospel known as "The Gospel according to the Hebrews" sometimes called "The Gospel of the Nazarenes". Jerome referred to this Gospel as"...the Gospel which the Nazarenes and Ebionites use..." (Jerome On Mt. 12:13). *It is interesting to note that the Qur'an does not refer to the followers of Jesus as 'Christians' but rather refers to them as "Nasaray". Another faith among the early followers of Jesus were the Gnostics. The gnostics were mystics of various schools of thought who thrived in the earliest centuries of Christianity in Egypt, Syria and Persia.2 The word Gnostic comes from the Greek word ‘Gnosis’ (knowledge) but does not refer to everyday knowledge or book learning. A central point of 'Gnosticism'3 is that each individual is born with a divine spark within him and it is the duty of the believer to try to find that divine spark. The point is to get into touch with God by looking inside oneself. It’s not about intellectual learning, it’s about the inner experience. What they were seeking was instead of learning about the ‘many-ness’ of things to the know about the one thing; the unity of all things. For almost two millennia the Gnosis was surpressed, it was mainly known only by the written condemnations of the 4th and 5th century church fathers. 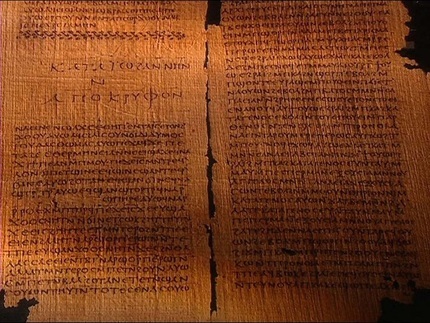 In 1945, however, there was a chance discovery of a cache of 4th-century Gnostic manuscripts near Nag Hammadi, Egypt. Now called The Nag Hammadi Library, it is a collection of thirteen ancient books (called "codices") containing over fifty texts. This immensely important discovery includes a large number of primary "Gnostic Gospels". The books were buried to evade a book burning expedition by the Roman Church during the early Christian struggle to define and impose “orthodoxy” on the Mediterranean world. and that Yehuda Toma the twin wrote down. And He said: "Whoever finds the meaning of these words will not taste death." [Gospel of Thomas, Logia 1]. If they ask you, “What is the evidence of your father in you?”say to them, “It is motion and rest.” [Logia 50]. Yeshua said, If your leaders tell you, “Look, the kingdom is in heaven,”then the birds of heaven will precede you. If they say to you, “It’s in the sea,” then the fish will precede you. But the kingdom is inside you and it is outside you. and you will understand that you are children of the living father. then you dwell in poverty and you are poverty. [Logia 3]. Here, it is clear that Jesus passed his legacy and leadership to the protection of his brother James. "This saying originated in a Jewish-Christian setting where James the Just, Jesus' brother, was regarded as the natural leader of Jesus's disciples after Jesus's departure. James was actually leader of the Jerusalem church for fifteen to twenty years, until his death in A.D. 62; his memory was revered and enhanced by legendary embellishments. (Jesus and Christian Origins Outside the New Testament, pp. 117-118). 1) Faithful adherence to the Law of Moses. 2) The exaltation of James, and the rejection of Paul. 3) A christology of “adoptionism” — they all believed that Jesus was the natural born son of Joseph and Mary and “adopted” by God as his Son upon his baptism by John. “Ebionite” was a term that the Nazarenes in Jerusalem took as their own self-appellation. It is derived from the Hebrew word evyonim, which literally means “the poor.” The term may be a technical one, not necessarily indicating peasants living in poverty (though their conditions were indeed relatively poor), but rather a self-designation of pride on the part of the Nazarenes, who called themselves “the Poor” because of their chosen ascetic way of life and renunciation of personal possessions (see Acts 2:44-45). So Where Did the Original Followers of Jesus End Up? Once the Jerusalem church was eliminated during the Bar Kokhba revolt in 135, the Ebionites gradually lost influence and followers. According to Hyamm Maccoby(1987) their decline was due to marginalization and "persecution" by both Jews and Christians. 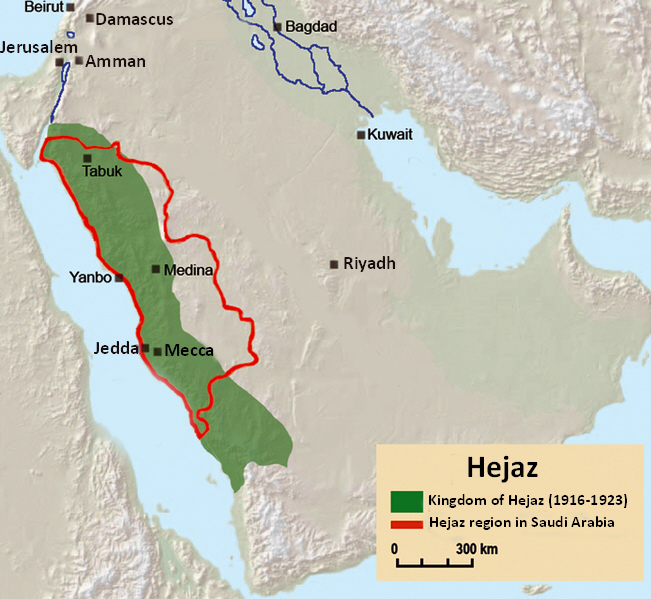 However, some scholars report that the Ebionites survived much longer, and that many migrated into the Hijaz, Arabia. The 12th-century historian Muhammad al-Shahrastani mentions Jews living in nearby Medina and Hijaz who accepted Jesus as a prophetic figure and followed traditional Judaism, rejecting mainstream Christian views. So, just outside of the reach of the Church of the Roman Empire, a man named Muhammad Ibn Abd'allah comes along. He revives the ancient teachings and sustains the traditions of forgotten communities suppressed by the official orthodoxy. Many have claimed that Muhammad founded a new religion but this was not his original message. H. Qur'an [2.136] "Say: We have faith in Allah and (in) that which had been revealed to us, and (in) that which was revealed to Abraham and Ishmael and Ishaq and Yacub and the tribes, and (in) that which was given to Moses and Yeshua, and (in) that which was given to the prophets from their Lord, we do not make any distinction between any of them, and to Him do we submit." H. Qur'an [46:9] Say, "I am not something original (an innovation) among the messengers, nor do I know what will be done with me or with you. I only follow that which is revealed to me, and I am not but a clear warner." In the Hijaz region of Arabia, around 608 A.D., Muhammad began to travel to Mount Hira for solitude, fasting and intense meditation. Muhammad was aware of the deep, hardening contentions and divisions between Christianity, Judaism and the various other groups. He was also aware of the many tribal gods in his region and sought a way to understand the commonality they all shared in terms of origin and nature. One night, after months and months of these periodic meditative retreats, sometimes lasting over 30 days at a time, Muhammad encountered an overwhelming, experience of enlightenment. Deeply affected, he returned home and related to his wife Khadijah what had happened. He thought he had gone mad. She consoled him, then brought him to her cousin Waraqah ibn Naufal. 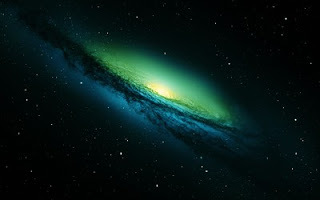 Muhammad explained what he saw, a powerful figure of light which filled the heavens. Wherever he turned, the figure was there, on every horizon, inescapably present. Waraqah confirmed that what had appeared to him in the cave was “the Keeper of Secrets (Gabriel) who came to Moses.” [Sahih Bukhari 1:1:3]. Suprisingly, (or not surprisingly) Waraqah was an Ebionite. Far from establishing a new religion Muhammad was continuing the tradition and practice of the spiritual communities that existed since time immemorial. For the next 23 years Muhammad attempted to translate his visions and experiences into words and ideas, of course, within the cultural milieu of his time. And in doing so became a living testament to the state of the culture, scriptures and traditions beyond the narrow constricted range of beliefs mandated by Rome. 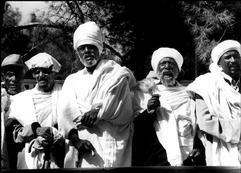 Not only was Mecca near Syria, Egypt and Palestine, it was also geographically and culturally close to Ethiopia. And many of the scriptures he was exposed to were still in circulation in Ethiopia and Nubia. “And certainly We created man, and We know what his mind suggests to him, and We are nearer to him than his life-vein.” (HQ 50:16). Muhammad was reviewing all the spiritual and scriptural information available to him and made distinctions between the various traditions in terms of what was most helpful and relevant, and where to draw the line in terms of wisdom, judgment and balance. Rather than coming up with new information, he called the Qur'an the Furqaan (the distinction, discrimination between true and false). During his mission, Muhammad was exposed to texts and oral histories of the Gnostics, Ethiopians and the Essenes. For example, one large distinction between so-called Christianity and Islam is that the Qur’an says Jesus wasn’t killed on the cross. Gospel of Basilides - He appeared on earth as a man and performed miracles. Thus he himself did not suffer. Rather, a certain Simon of Cyrene was compelled to carry his cross for him. It was he who was ignorantly and erroneously crucified, being transfigured by him, so that he might be thought to be Jesus. Moreover, Jesus assumed the form of Simon, and stood by laughing at them. Kelhoffer, James A. (2014). Conceptions of "Gospel" and Legitimacy in Early Christianity. Mohr Siebeck. p. 80. ~Gospel of Peter. "The Complete Gospels: Annotated Scholars Version" edited by R. J. Miller (HarperCollins, 1994, 3rd edition). Keep in mind that with the discovery of the Nag Hammadi scriptures, it becomes clear that the decision to include or exclude a scripture in the 'Christian Bible' was not necessarily based on concerns about unknown authorship, authenticity or credibility. Often books were left out because they were simply not in line with the dogma and opinions Rome was trying to establish. For example most scholars will tell you that whereas seven of the 13 letters that go under Paul's name are his, the other six are not. Their authors merely claimed to be Paul. What Was Muhammad Trying To Do? Muhammad was trying to express the principle of Tawhiyd (Oneness). This was the overwhelming understanding he received in his enlightenment. This has been mistakenly translated as monotheism, but rather Muhammad was trying to relate an ancient understanding, that all is one. All the gods are one, there is unity in the diversity in nature, and we as human beings are all one with each other. All is bound together. He called this oneness 'Allah', the ultimate reality. And the ultimate reality requires that we treat each other with kindness and respect because we are connected in ways we don't even fully understand. He also tried to teach his people how to draw near and tap into the Divine light he experienced through, contemplation, remembrance (of their true source), meditation, and prayer (without the need of priests or bishops.) He called the way of life he taught 'Peace'- acceptance of the Divine reality, and the submission of the ego to the Divine or the higher Self (within and without). Nowhere in the Qur'an is the word religion mentioned. The word translated as 'religion' is 'diyn'. Diyn means judgment, governance, self governance or inner conscience. It is our nature, that innermost voice which governs our upright conduct. H. Qur'an 30:30 "Then set your face upright for religion (diyn) in the right state-- the nature made by Allah in which He has made men; there is no altering of Allah's creation; that is the right religion (diyn), but most people do not know." This was the source of power. Coupled with the application of 'intention', it was the gateway to vast resources of creative, dynamic human potential. But over time many have used this power and Muhammad's name for political and economic gain. Muhammad died leaving few possessions having given away all the material wealth he accrued to the needy over his life. His successors, (after his only appointed successor Ali ibn Abu Talib), built empires and conquered regions once controlled by Christian (Byzantine) Rome - and over time took on the same administrative and religious structure as the Christian lands they conquered. Eventually Islam became an empire and a religion. And as scholars, judges and Caliphs became more involved in it, Islam became increasingly, 'orthodox' rigid and authoritative. However Muhammad's original spirituality and simple purity was never forgotten and survived in the form of Sufism. 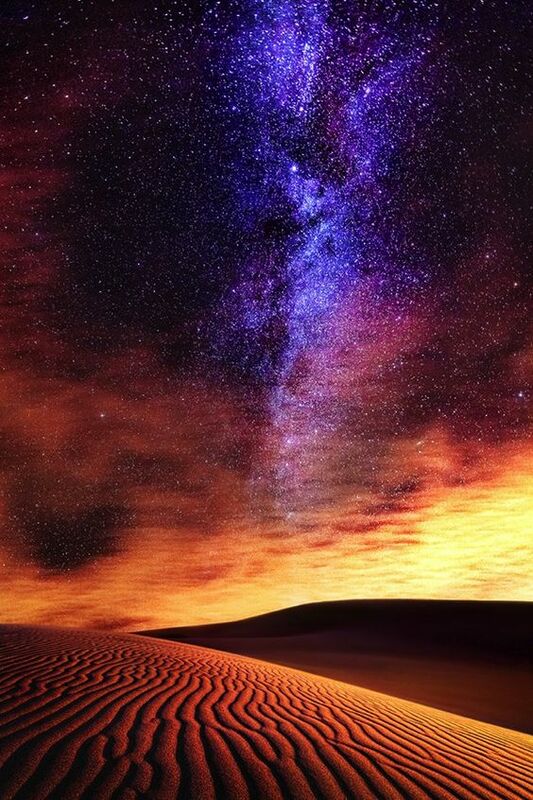 "There are as many paths to God as there are souls on Earth" ~ Sufi saying. The Sufis are an ancient spiritual order whose origins have never been traced or dated; nor do they themselves take much interest in such researches, being content to point out the occurrence of their own way of thought in different regions and periods. Though commonly mistaken for a Muslim sect, the Sufis are at home in all religions. If they call Islam the "shell" of Sufism, this is because they believe Sufism to be the secret teaching within all religions. One of the first to articulate the teachings of Sufism was the Nubian, Dhu’l Nuwn. He was a link to a number of mystic traditions. His father Ibrahim was a Nubian who had converted to Islam, becoming a master (mawla) among the Quraysh tribe from which Muhammad himself descended. In brief, Dhu'l Nun was one of the Egyptian mawali, a native of the Nile valley who learned Arabic culture and language under Quraysh auspices. Whatever the precise details of his parentage, his cultural background was substantially Coptic, and also featured architecture from the pre-Christian period. His birthplace Akhmim had a history going back to the Pharaonic Old Kingdom era some three thousand years before. It is likely that Dhu'l Nuwn spoke Coptic in addition to Arabic. Many sources credit Dhu'l Nuwn with a large number of disciples in tasawwuf (Sufism) throughout Arabia, Palestine, Egypt and Syria. 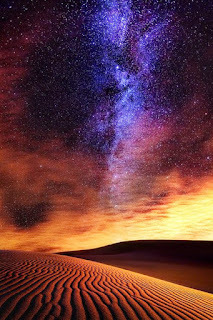 “Whatever you conceive with your imagination, God is other than that.” ~ Dhu'l Nuwn. So what shall we call this practice of self -discovery and self knowledge? And why is this important for Black People? Self-knowledge is an essential component to self -determination. Cultivating the wisdom within us will help us reach a heightened awareness grounded in the present; that intensified consciousness - the flash of power experienced when you make determined choices rather than simply react to external circumstances. It is finding the power to choose…balance. "Have the wisdom to abandon the values of a time that has passed and pick out the constituents of the future. An environment must be suited to the age and men to the environment." ~ Proverb found in the inner temple of Karnak. As shown in this overview- dates, names, histories become blurred over time, but one reality stands, our Divine selves. So ultimately, no one rules over us, and with this understanding no religion can control us. We are taking over now. "Never be enslaved to principles." not Hindu Buddhist, Sufi, or Zen. origin story. My place is placeless, a trace of the traceless. 1. P. F. Service, The Ancient African Kingdom of Kush (Cultures of the Past) (New York: Benchmark Books, 1998) 35. 2. A number of Gnostics were called Neo-Platonists. Neo-Platonism is the modern term for a school of Hellenistic philosophy that took shape in the 3rd century, based on the teachings of Plato and some of his early followers. Many Greek philosophers had studied at Egyptian schools. Iamblichus wrote that Thales of Miletus insisted that Pythagoras had to go to Memphis to study because the Egyptian priests were a veritable source of knowledge and wisdom, especially when it came to the natural sciences, medicine and astronomy. (See, “The Pythagorean Sourcebook and Library: An Anthology of Ancient Writings Which Relate to Pythagoras and Pythagorean Philosophy,”Kenneth Sylvan Guthrie, p.59-60. “And Plato does not deny that he procured all that is most excellent in philosophy from the barbarians; and he admits that he came into Egypt." The Stromata (Book I) Chapter 15. 3. The word as applied in English and in the context of "Gnosticism" is a 19th-century construction first made by Henry More, but is based on the use of the adjective "of knowledge", (Greek γνωστικός) by Irenaeus (c.185 AD) to describe the school of Valentinus.